The loss of a job can be one of the most challenging events you will face. A job loss affects your finances on every level. And, due to the fact that the economy is making a significant shift, it’s important to realize that a job loss is an increasing possibility. Gone are the days when you could get a job and expect to have it for two or three decades before retiring. These days, the new economy focuses on jobs that are much more temporary. You are likely to change jobs several times throughout your life, and some of those changes may not be voluntary. In order to prepare for these types of difficulties, it’s important to develop income diversity. 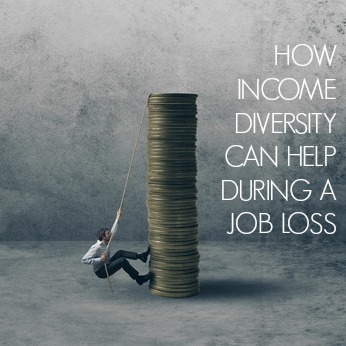 Income diversity reduces your financial risk, and can help you during a job loss. When the bulk of your income is from a day job, you are putting your finances at risk. The reality is that relying heavily on your day job for your financial well-being can be extremely risky. Once you lose your job, your entire livelihood is gone. If you develop multiple sources for your income, some of that risk is alleviated. If you have a little bit of income coming from a side business, or if your partner works part-time, you aren’t quite as devastated when you lose your job. After all, there’s still some income trickling in. It might not be that much, but it’s better than nothing. And, since unemployment benefits won’t replace your income, it’s good to have these other sources to help supplement your unemployment benefits. It will mean that you won’t draw down your emergency fund as quickly. As with all things personal finance, it’s best to prepare for difficulties ahead of time. You can use income diversity to your advantage before you even lose your job. The best approach is to live on what you get from your main day job and put the extra income from your diverse sources to work ahead of time. Pay down debt: If you have debt obligations, use your supplemental income to get rid of high-interest debt. The fewer obligations you have if you lose your job, the better off you’ll be. That way, you don’t have to worry about the credit and income consequences that come when you end up missing debt payments. Build your emergency fund: Your extra income can be a great way to pad your emergency fund. Whether you keep your emergency assets in a high-yield account, or whether you look for better yield with the help of a taxable investment account, using your extra income to build up for an emergency can be smart since it will help you get through a job loss. Continue to invest in your future: Diverting some of your income toward the future can also be a good idea. You can build your retirement nest egg or start an income portfolio. It can take time to build an income portfolio, but it can be worth it in the end if you manage to get some passive income. This passive income can, in turn, become another income stream that can help during a job loss. It’s never fun to think about the possibility of a job loss. However, it’s important to be on top of the situation, and make sure that you are prepared for the possibilities. Cultivating income diversity is a good way to get a little extra money to better your situation now, and protect you against problems in the future. Do you have multiple sources of income? If not, what are you going to do to achieve it? Leave a comment!